Rivers United and Shooting Stars Sports Club got us underway in the Matchday 26 encounter as John Odumegwu’s solitary strike sealed the victory for the Pride of Rivers who continued their slim-margin wins in Port Harcourt. The victory takes Stanley Eguma’s side to 13th and Shooting still struggling in the red zone. 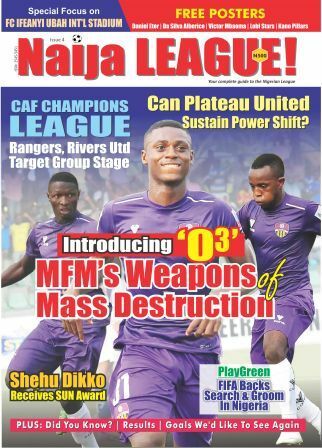 Plateau United’s title chase will undergo a big test as they host the Solid Miners in Jos. The Peace Boys have been cruising on the summit of the table more than any other club this term. Wikki Tourists and Lobi Stars lock horn in Bauchi. They Bauchi Elephants picked up their first point on the road in Nnewi in the previous matchday and this has seen them gradually quit the drop zone. They will take maximum advantage at home to get past Lobi Stars who beat them 2-0 in Makurdi in the first leg. Lobi occupy the 5th position on 39 points. With a win, the homers will see their NPFL status get better as the presently lie on the verge of relegation, 16th with 31 points. Akwa United take a road trip to Sagamu for a date with relegation threatened Remo Stars. The Promise Keepers have apparently overcome their very poor start this season to become title contenders. Remo Stars’ composure on the pitch surprisingly overrules their position on the log. Considering their confidence and composure on the ball, they will give their host a good run for their money. Ladan Bosso leads his Warriors to Calabar as Enyimba play host. The People’s Elephant managed by Gbanga Ogunbote cannot afford to drop points at home if they really want to mount pressure on league leaders. The stake is high and El-Kanemi are definitely no push overs. In other fixtures, Gombe United entertain Abia Warriors, ABS FC welcome Kano Pillars and Niger Tornadoes travel to Kastina. Another mouthwatering encounter is the southwest derby, where MFM FC trades tackle with Sunshine Stars at the Soccer Temple, Agege. FC Ifeanyi Ubah takes the lead when it comes head-to-head with Enugu Rangers; the Anambra Warriors have been a difficult side for their Oriental Neighbours from the Coal City. This fixture at the Cathedral presents the homers another opportunity to turn the tide as FC Ifeanyi Ubah go into the game on the back of a bitter home draw against Wikki Tourists. For Rangers, their last game on the road, against Niger Tornadoes also ended with a draw, a good one for the Flying Antelopes. One thing is certain; both sides are desperate for points. Rangers need to catch up and at least cement their place in the top flight, while FC Ifeanyi Ubah have to keep pace with the top, for a title glory or worst, a continental spot. As it stands, Chukwuma Agbo’s men occupy the 14th spot with 32 points while FC Ifeanyi Ubah are 6th on the log having garnered 38 points. If the form guide is anything to go by, Rangers are the better side for the day considering the fact that they have not lost in four games, although they have recorded 3 draws. FC Ifeanyi Ubah in their last four encounters have picked up 4 points having lost two games on the road, win one and drew the other, at home.